Russia is evacuating its citizens from Syria, one of its most important beneficiaries in the Middle East. Russia is beginning to evacuate its citizens from Syria. 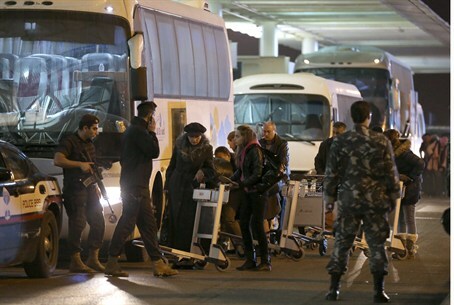 Some 80 Russian citizens fled the war-torn Arab nation early Wednesday, crossing into Lebanon before flying back to Moscow. The evacuation came in the wake of a last-ditch mission by United Nations Relief and Works Agency (UNRWA) official John Ging to assess conditions and find a way to negotiate a political solution to the conflict. It was a deliberately low-level move, designed to avoid a public rebuke to Syrian President Bashar al-Assad. But the evacuation was nevertheless a significant warning that Moscow – one of Syria’s two largest allies -- has lost confidence the regime can survive the civil war that has finally reached the capital. With a fierce battle between government troops and rebel forces tightening around Damascus International Airport, it is not clear how much longer Assad will remain in power. Most of the country’s major cities, and nearly all of its towns and villages have already been turned to rubble. Since the fighting reached Damascus several months ago, the once-lovely neighborhoods that boasted ancient architecture have also slowly succumbed to the civil war, as Assad’s forces bombed their own capital hoping to root out rebel fighters. More than 30,000 Russians are believed to be living in Syria. But of the 80 who left, at least one was willing to tell The New York Times how grateful he was. “You get it from all directions. If the Free Army catches you as a Russian citizen, they’ll cut off your head. Just like that,” Albert Omar said, gesturing to the reporter. “And from the other direction there are the bombings, the rockets. They’re attacking the Free Army, but you hear it, the rumble, and you feel it.